Who can say no to an all-graphite strengthened frame and a handle design that eliminates backplay? The Penn Captiva Spinning Reels' features include 8 stainless steel ball bearings, Infinite Anti-Reverse roller bearing, long-cast aluminum spool, lightweight graphite body. Plus, the Captiva's Techno-balanced rotor provides smooth retrieves even in high cranking speeds. This reel is no longer available. Please click the link below to view a similar model. 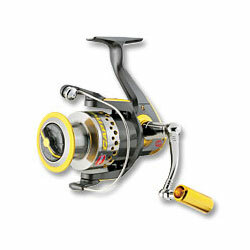 "The price point with this reel is not too pricey still I think its higher than its actually worth. The durability on these reels is simply not there. If I'm spending the money to buy one, I want it to last more than 1 maybe 2 seasons of moderate use." "I have been using this reel for a couple of months now and i must say this reel is very good for the price." "This is an okay reel for the money. I use it for fluke fishing and for surf fishing. It handles small and medium fishes fairly well. " "I purchased this reel for my Mother as a birthday gift end of last summer. This reel is used only a couple times a month durring the summer for bottom fishing in the chesapeke bay. Usually catch 8-10" perch and 8-11" Spot with this reel so it gets lots of reeling action but not much stress."